Commercial countertop food chillers are quiet and energy-efficient electric units that keep foods like fruits, vegetables, and other products safely chilled indefinitely. 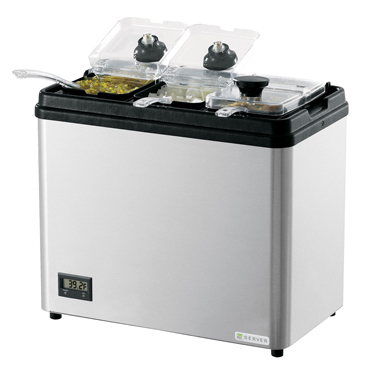 Keep your foods fresh tasting and safe from contamination by using countertop food chillers. Eliminate the hassles of ice or ice pack cooling. Store and display perishable cold foods like fruits, vegetables, condiments, creamers, and other dairy products safely chilled below 41° F (5° C) indefinitely. Featuring small footprints, countertop food chillers can fit just about anywhere to help improve workflow at your establishment. A great addition to any kitchen or concession stand with limited workspace. When shopping for food chillers, consider Thermoelectric Chillers which can keep your food at a perfectly chilled temperature so your cold foods stay safe and always taste their best.